Is it just me or did this weekend seem to fly by? I feel like I blinked and it was over! Did you all have a wonderful weekend? I hope you did! Minnesota got their first big snow fall of the year. And I have to say that now it just feels like the Holidays! The snow has blanketed everything! And even though it is cold, at least it is pretty! Saturday was a bit of an adventure, I guess you could call it that. My mom, Melinda and I ventured out to shop Grand Ave. in St Paul. Grand Ave. is made up of quaint little shops, and a few big staples like JCrew, and North Face (just to name a few) and many fabulous restaurants. Add fresh falling snow, a glorious piece of cake, great company, shopping, Christmas spirit, and well that just sounds like the perfect day to me! I was really excited when I found the perfect gifts for Mark and my dad! But you w ill just have to wait and see what I got them (since they both read the blog)! So for now lets talk this glorious piece of cake! 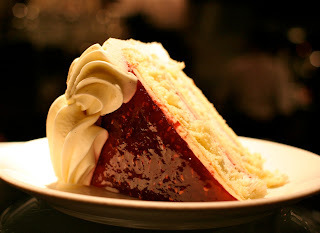 They have some of the best soups I have ever had, and desserts that are to die for! A favorite of my family (my sister had this cake recreated for her graduation open house) is Cafe Lattes Raspberry Tort! but in my mind both are equally out of this world good! And if you are wondering you can find the recipe for Cafe Lattes famous Turtle Cake here! 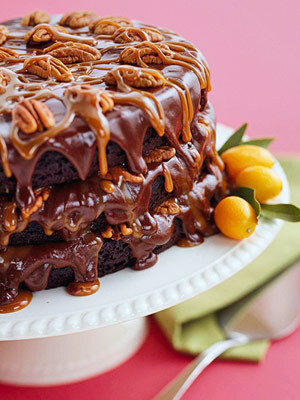 So now that I have probably made you drool on your computer I suggest that we all take the day off, enjoy a warm cup of coffee, and make this drool worthy cake! I live in Chicago and we haven't had our first snow yet. I actually dread the first snow if it happens on a weekday - people completely forget how to drive! If it happens on the weekend I totally love it! Yay Christmas. Love the snow...and glad you were productive this weekend! I wish it would snow like that in Alabama!! So beautiful! I haven't seen the snow in years... This makes me want to go find some! And those treats look amazing. i want to go shopping with you there! it looks so cute!! and i am drooling over that cake, gosh i soo want a piece! I'm in DC and no snow yet... but they are dreading it... ha! have a great week! Seriously all I want right now is a slice of that dessert. YUM!! I am ready for snow. I know I shouldn't be saying that because I am asking for it but I do kinda want some! THanks for the comment today! Look at all that snow! mmm that looks so delicious! mmm that cake looks amazing! sounds like a perfect weekend!!! the snow is so beautiful...i miss the first snow fall of the year..it doesn't snow that much in DC! the desserts look so good! Glad you had a good weekend. That snow is so pretty!! Those cakes looks so yummy, your making me want cake and coffee!! Have a great evening. Sounds like a wonderful and delicious weekend! I am so jealous of the snow! I love the snow, but it definitely doesn't snow in Sacramento, CA. It just doesn't feel like the holidays if it's sunny and green outside. Grand Ave. looks so charming! I would love to spend a relaxing weekend afternoon somewhere like that. And those cakes! look amazing! yummm!